Sassari offers several leisure activities and can be enjoyed in many ways: as comfortable base to visit the wonderful sites nearby; as opportunity to get to know the city and put yourself in its friendly and convivial environment. It is true that you can do both things at the same time, as there is no lack of attractions and places of interest. And if you are in the city for working purposes, nothing prevents you to mix business with pleasure. 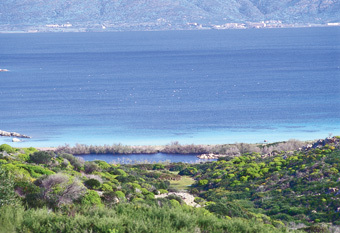 of Asinara and lies on a bright calcareous tableland which gently slopes down to the coast. The city is very near to the sea whose scent is pleasantly noticeable in the air. 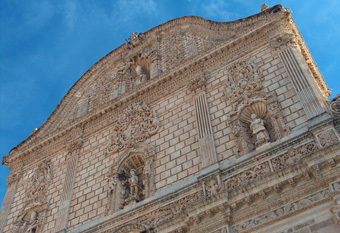 Cosy, vivid and dynamic, Sassari retains the vestiges of a past sinking its roots in the middle ages as it became a free city, a centre for trades and a major cultural attraction. In that period the historical centre got its actual shape which you can recognize in its distinctive maze of streets, alleyways and little squares where the most authentic spirit of the city lingers. Inside the ancient city walls, of which some stretches still exist, you encounter the most significant historical and artistic monuments: the Cathedral in Catalan gothic style, the late Renaissance church of St. Catherine, the medieval church of St. Mary of Bethlehem, the sixteenth-century Fountain of Rosello, the Ducal Palace, the Usini Palace and the building of the Jesuit College which now houses the University. 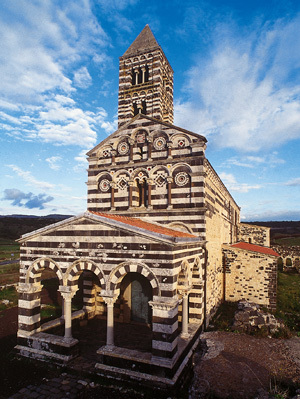 of St. Antony, of the church of the Rosary and of the thirteenth-century monastery of St. Peter in Silki). The most recent urban tissue is in turn rich of element of interest and appeal, from the eighteenth-century expansion around the wide square of Piazza d'Italia, which is the traditional meeting place of the city. The architectures which surround the square form an homogeneous and organic whole of remarkable visual impact. 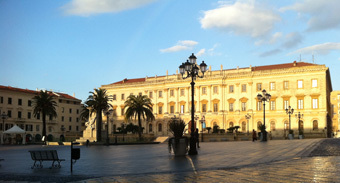 The most prestigious and impressive building is the Province Building in Neoclassical style. On the other side of the square is the Giordano Palace in Neogothic style. Craftsmen's workshops, outdoor cafes, entertainment venues, big and small stores for shopping and many food courts, trattorias and restaurants which offer even the oldest and most genuine dishes from the local gastronomic tradition. 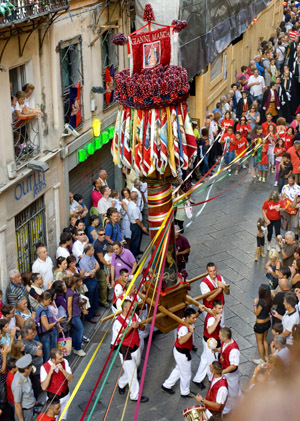 on the 14th August: the streets of the city centre become the setting of the Faradda di Li Candareri (the Descent of the Candle Holders) a procession which recurs for centuries to fulfil the vow made to Our Lady of the Assumption who saved the city from the plague in the sixteenth century. The leading actors of the Faradda are the gremi (i.e. the medieval guilds) whose members carry on their backs heavy lavishly embellished candlesticks and dance until they come to the church of St. Mary of Bethlehem. (Sardinian Cavalcade) which is held once a year on the penultimate Sunday of May. This laic event consists of a parade - on foot or on horse - of folkloristic groups wearing the rich traditional costumes from the different parts of Sardinia. Also the hinterland has remarkable landscape and cultural attractions. You only need a few minutes to reach the thick pinewood and beach of Platamona, an ideal beach destination which is enjoyable even in winter and autumn with plenty of warm and sunny days. the village of Stintino with the famous Pelosa beach, separated from the near island of Asinara from a turquoise sea inlet; the monumental Romanic-Pisan basilica of Saccargia, the most famous in Sardinia in this style; the near city of Porto Torres, which is also rich in archaeological remains (the prehistoric altar of Monte d'Accoddi) from the roman (Antiquarium and archaeological park) and medieval periods (the basilica of St. Gavinus which is the biggest and oldest Romanic church of Sardinia).